One Million Dollars, hoo hoo hoo hah hah hah! 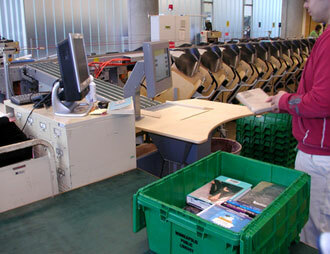 For a cool million bucks, you can have Minneapolis’s automated book-sorting system. Adapted from the travel and postal industries, an employee beeps in the item at the beginning of the belt and the system allows it to travel a prescribed distance before a pneumatic arm pops out and flicks it into one of 40 specific bins. Course, with 25 branches and a cathedral like the downtown building, a nifty doohickey like this comes in handy. Can you fathom there are library systems larger than Davenport, Iowa’s? I Know! 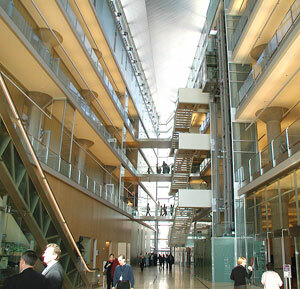 They must have a real savvy HR person at the San Francisco Public library system to keep tabs on their 800 employees. One of the cool things from attending the Public Library Association’s conference last week was the opportunity to see how these mega-systems keep things running smoothly. 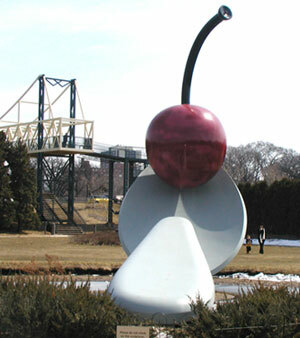 Enjoy the additional shots of reflecting downtown skyscrapers, the five-floor Jetsons-esque view from the Minneapolis Public Library entrance, and the world’s most gigantic cherry from the Minneapolis Sculpture Garden. 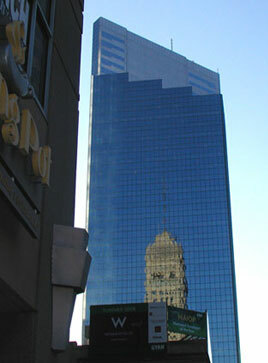 Hey Bill, Great stories and pictures from Minneapolis. Who knew librarians had secret lives? Thanks for sharing.